Also referred to as ‘dancing eye’, is an eye disorder that is characterized by involuntary rapid movements of the eyes. The eyes continue to move even when you try to lock your gaze on a visual target. The eyes may swing from side to side, up and down or in rotary motion. About 1 out of every 1000 people have this eye disorder. You may notice people with this eye disorder tilting their head to an often awkward position. This position is called the ‘null point’. At this certain angle, their eye movement are reduced and thus the image is stabilized image for clearer vision. The involuntary eye movements may improve slightly once the child reach adulthood. However, it can be worsened with fatigue, nervousness and stress. Many nystagmus sufferers experience reduced visual acuity and depth perception. Most are unable to get a clear image due to the constant uncontrolled movements of the eyes. They often encounter difficulties in both practical and social aspect of their lives. For example, the affected visual perception makes it unsafe for them to drive. Their balance and coordination skill are also affected, making them lose out in activities that require good hand-eye coordination such as sports. Needless to say, their self image is severely hampered as the involuntary eye movements make them look ‘weird’. Therefore, it is important to reassure the child that it isn’t the end of the world. They will grow up and live well just like any other normal children. See Helping Children With "Dancing Eyes" for various ways you can help your child. Nystagmus is mostly caused by neurological problems. The involuntary eye movements happen when the regions of the brain that control eye movement are dysfunctional. This eye disorder can be inherited (congential) or appear in early childhood. It can also be acquired later in life due to accident or illness, especially if the motor-muscle system has been affected. In the nutshell, the involuntary eye movements are just a symptom of some underlying eye or health problem. Children with this condition are usually not aware of their condition as their world view doesn't not seem shaky to them. They see the world similarly with normal children albeit with some blurriness. It can also be caused by fetal alcohol syndrome. Currently, this eye disorder cannot be cured. 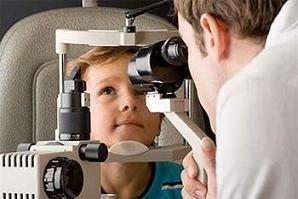 The severity may reduce as the child grows older but this eye disorder is never truly eliminated. Since nystagmus most commonly begins at birth, the main goal of treatment is to minimize the visual disturbances caused by the condition. There are several treatments available to control and reduce the visual disturbances. While corrective lenses do not correct the eye movements, they can help to correct other vision problems such as nearsightedness, farsightedness or astigmatism. According to AllAboutVision, contact lenses are more effective than glasses for vision improvement as contact lens’ center moves with the uncontrolled eye to provide clear vision. There are also school of thoughts which claims that contact lenses can reduce the magnitude of the jerkiness. Certain medications such as botulinum toxin (Botox) can be used to reduce the involuntary eye movements by weakening the eye muscles which control the eye movement. Nonetheless, their results are often temporary and can cause serious side effects. Eye muscle surgery (strabismus surgery) may be appropriate for some cases with extreme null position (where the patient has to tilt their head awkwardly). The goal of the surgery is to reduce null position and improve the overall cosmetic appearance. Vision therapy (eye exercises) may help to reduce the symptoms and give the person some control of his or her eye muscles. Ask an eye doctor who is specialized in vision therapy for help.